According to analysis from AHDB Pork, an increase of just under 1% was recorded in the total pig herd, while the breeding herd grew by just over 1% year-on-year. The significant improvement to pig prices and producer profitability, starting in the latter half of last year, seems to have encouraged some recovery in numbers following prior rationalisation of the European herd last year. The overall modest increase in the breeding herd suggests that slaughterings should pick up towards the end of this year and into 2018, boosting the availability of supplies on the market. 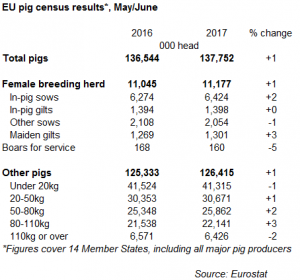 In the shorter term, higher numbers of finishing pigs between 20-110kg were also reported, driving the overall 1% increase in the total EU pig herd. While many of these pigs will have been slaughtered by now, this backs up reports of greater supplies coming onto the market in recent months. It also suggests throughputs will likely remain above 2016 levels in the short term. Interestingly, piglet numbers were slightly (<1%) lower than year earlier levels. However, given the increasing sow herd, numbers would be expected to have subsequently picked up. While most of the key producing states reported year-on-year growth in both their female breeding herd and total pig herd, the scale of this increase was varied. Both Spain and Poland reported a 4% increase in their total pig herd compared to year earlier levels. Within this, the Spanish breeding herd recorded a notable 6% increase year-on-year to the highest level since 2010. 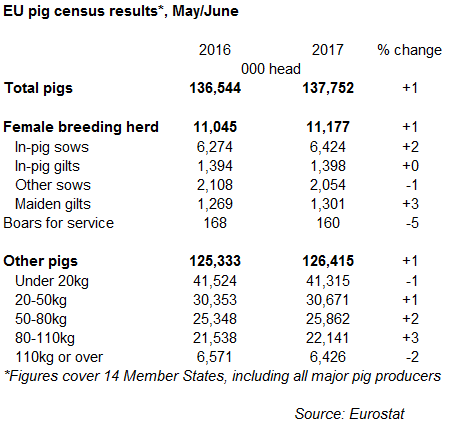 More modest recovery was reported in the breeding herd of the Netherlands (+1%), though this did not translate into the finished pig herd which remained stable year-on-year overall. Similar to Denmark, growth in piglets and weaners contrasted with the decline in numbers of heavier finishing pigs, likely related to increasing live exports of young pigs for finishing in Germany. However, the total Danish herd was still 1% higher than in 2016 overall. As such, while the German breeding herd has remained in decline. In France, meanwhile, the breeding herd appears to be continuing to decline. The female breeding herd recorded a 2% fall on mid-2016 levels, and numbers of maiden gilts were also back, by 5%. 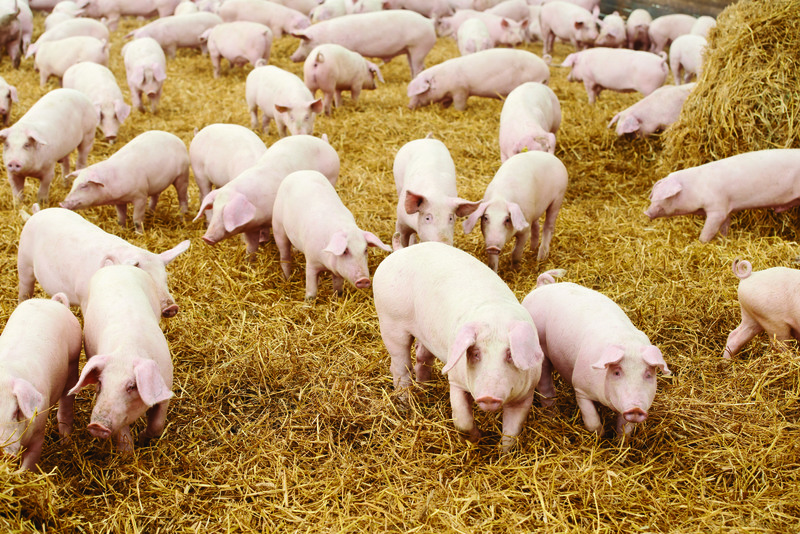 Overall, the expanding pig herd could prove challenging for the EU pig market moving forwards. While strong third country exports were able to counter subdued domestic demand in 2016, the slower Chinese market has reduced export demand this year. As such, while tight supplies had been price supportive earlier this year, any expansion moving forwards could risk tipping the supply-demand balance. Developments in Spain and Poland, both major exporters, could be especially critical. As US production will continue to move up, at more competitive prices, the EU market may come under increasing downwards pressure in the coming months, with repercussions also felt here in the UK.